Can you believe it's October already?! I do like this time of year - the leaves changing colour, winter soups and stews, Bonfire night and the thought that it's less than three months before the evenings start getting lighter again! Of course it does mean that bootcamps are now going to be in the dark and it will be colder but don't let that deter you. It's always an effort to remove yourself from the sofa when it's cold and dark outside but once you get out, meet up with others and get stuck into your workout you won't even notice. In fact some people prefer winter workouts as heat and humidity is not an issue as your body is better at regulating it's temperature meaning you can workout harder and for longer. Studies have shown that being outside in cold weather can transform white fat, specifically belly and thigh fat, into calorie-burning beige or brown fat. Brown fat's purpose is to burn calories to generate heat. Brown fat is often referred to as the "good" fat because it helps to burn rather than store calories. Well done to everyone who took part in an event in September. 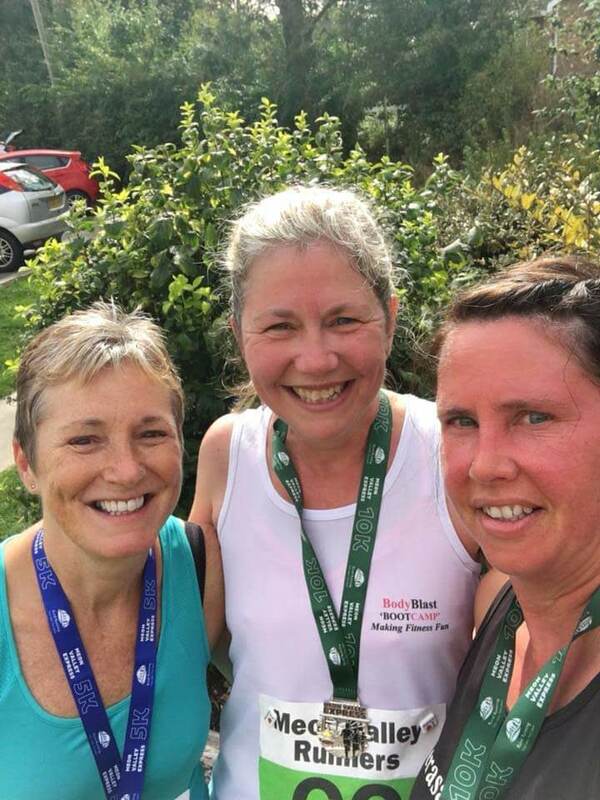 We had Mandy, Annette and Terasa who ran in the Meon Valley races, Dawn who did Tough Mudder and Mandy and Annette travelled 300 miles to take part in the Great North Run. Well done ladies. 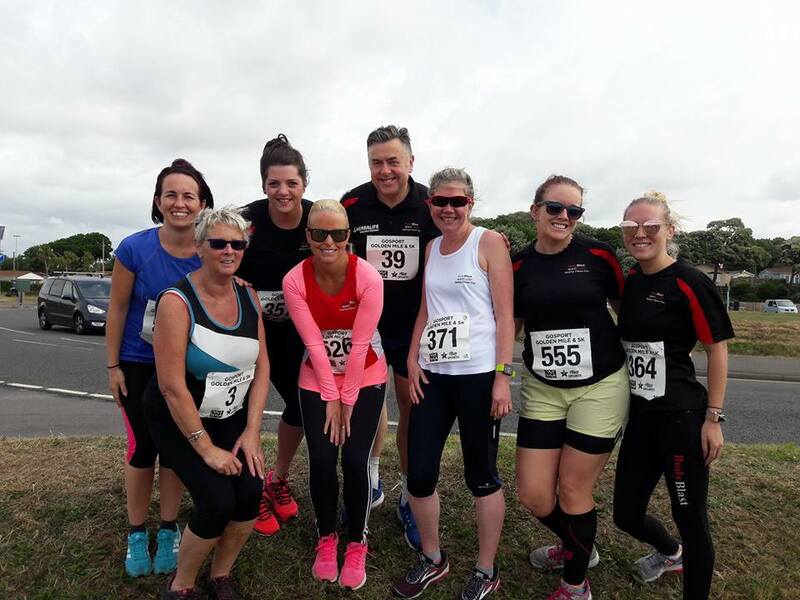 I am looking forward to seeing everyone's photos from various events this month including the Great South Run of which we have a few bootcampers taking part and of course our own charity walk, more details of which are below. 1. Make sure you have trained for the distance you are doing. Even if you just plan to walk it then ensure your footwear is suitable. The more training you do, the more you will feel prepared and the less chance of injury. 2. The night before make sure you have everything ready - clothes, trainers (with chip attached if provided), bib number pinned to running top, snacks, water, change for car park, tissue in case the porta loo has run out, bin bag/old clothes to keep warm before the start. 3. Don't overload on the carbs the night before as this may lead to an upset tummy. Graze on carbs throughout the day before instead. For shorter distances like 5K or 10K you don't need to carb load as you should have enough reserves to get you through. 4. On race day or even the week leading up, don't try new foods, energy gels, drinks, clothing. Stick with what has worked already for you. 5. On the day arrive early so you have time to warm up, use the loo and soak up the atmosphere. 6. Don't guzzle a load of water 30 minutes before the race. There is nothing worse than a sloshing stomach during a race (believe me I know). Hydrate properly the day before and then sip if your mouth is particularly dry or it's a warm day. 7. Don;t wear too many layers. It may be cool or chilly to start with but once you get going you don't want to have to be carrying clothing with you that isn't needed. 8. Don't stress about coming last or not finishing with your mates. 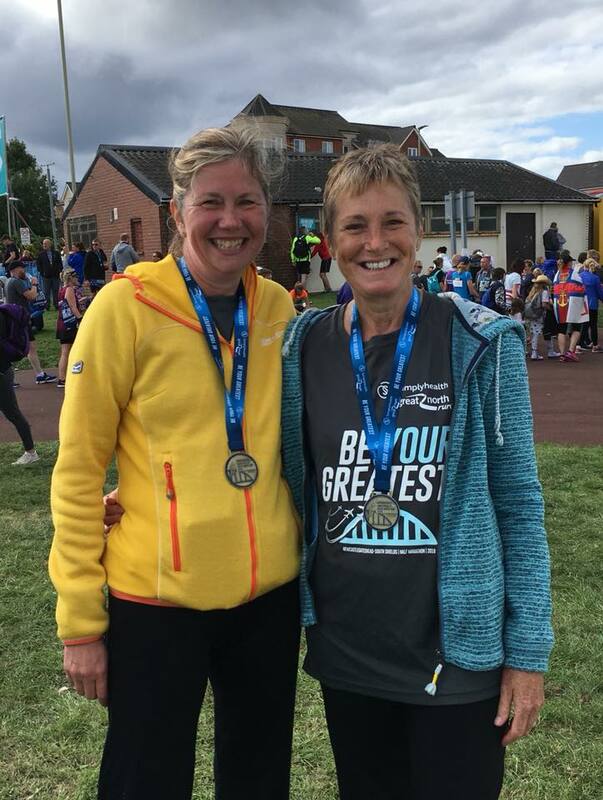 Chances are you won't be last and if it helps agree with your friends beforehand if you will run together or just do your own thing and just be there to cheer each other on at the finish line. As the days get colder there is nothing better than a warming bowl of soup. 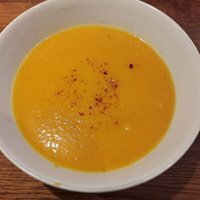 With pumpkins and relations of in season, this soup recipe is filling and easy to make. Butternut squash is packed with anti-oxidants, Vitamin A to boost the immune system and potassium for healthy and strong bones whereas sweet potato is rich in fibre and helps stabilize blood glucose levels so helping to avoid those crashes come mid afternoon. The soup has a smooth texture without the need to add any cream. You can roast the squash and sweet potato to help retain the vitamins and then just add to the stock when ready to blend. Or just throw it all in a pan, bring to the boil and simmer until the vegetables are soft. Add some chilli if you like a bit of heat - I use dried flakes to sprinkle on top. Method: Fry off the onion and garlic. Cook the vegetables by either boiling or roasting. Blend all ingredients together adding water to achieve desired consistency. Reheat and serve. Well done to everybody who took part in the fitness assessments in September. The idea of these is to give individuals a benchmark of where they currently are in terms of their fitness and we will do the same test again before Christmas to see how much improvement there has been. Hopefully this will keep you motivated over the next few weeks as the evenings get colder and darker. Whoever improves the most will win a free month of bootcamps in January so it's worth sticking with it. If there is a tie I will look at at who has attended the most bootcamps between tests. On Saturday 13th October we will be holding a charity walk in aid of Fareham Basics Bank. 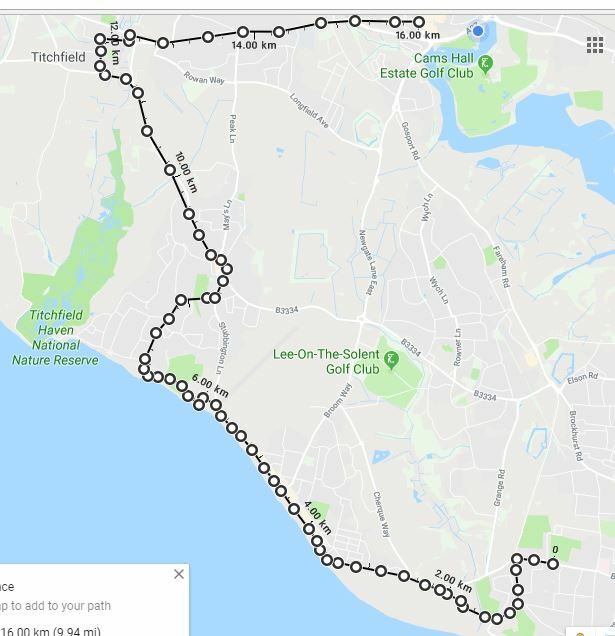 This will be a 10 mile walk starting from Privett Park, Gosport at 9:30am and finishing at Fareham Basics Bank in the town centre between 1pm and 2pm. We will walk through Lee on Solent, Stubbington and Titchfield before heading into Fareham. So far we have 14 confirmed participants consisting of members and non members with plenty of room for more. We have 3 supermarket trolleys to load up and take with us as well as whatever participants can carry. I am very excited to say that The News will be there to meet us at the end of the walk to cover our story. If you are unable to take part but would like to make a donation then these can be dropped off either on the day or at any of our bootcamps over the next two weeks (see our new timetable of sessions below). If you would like to take part then just drop me a line at karen@bodyblastbootcamp.co.uk. Did you know....A pound of muscle burns 3 times more calories than a pound of fat. Personal Training Special Offer Coming Soon! Did you start off the year with good intentions to sort out your fitness, lose some weight, eat better but never followed through? Do you feel that with only 3 months left of the year your goals are unachievable and you might as well try again in January? Would it help if you could have somebody to guide you through what to eat, the best exercises to do to achieve your goals and have somebody (ie me) to hold you accountable? "But I can't afford personal training" I hear you say.. Well keep an eye out in your inbox over the next couple of weeks for a special offer on personal training to help you start feeling fitter, healthier and happier before the year is out. Don't dilly dally though as I will be limiting it to the first 5 people to claim the offer.